British PM Gordon Brown had been under pressure to testify at the Iraq war inquiry before the next general election. 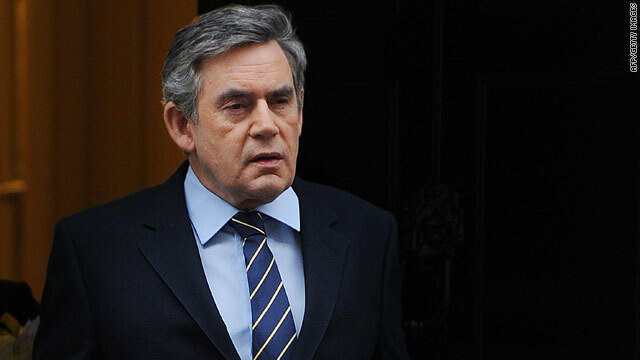 London, England (CNN) -- British Prime Minister Gordon Brown will testify at the Iraq war inquiry sometime in the next two months, the head of the inquiry said Friday. That means Brown will testify before Britain holds general elections, widely expected on May 6. Brown has come under increasing pressure to testify before the elections, in which his Labour Party faces a tight race with the opposition Conservative Party. Recent public opinion polls have shown the Conservatives more than 10 points ahead of Labour. Inquiry Chairman John Chilcot said committee members previously decided not to call any government ministers who are still serving in posts relevant to Iraq. But Brown, who ran the British Treasury before and early in the Iraq war, offered to give evidence at any time. "You have proposed a range of dates in the next two months," Brown wrote Chilcot on Friday, in a letter released by Brown's office. "I will be happy to agree a date that is to the convenience of the inquiry." Chilcot suggested that Brown appear in late February or early March. Former Defense Secretary Geoff Hoon testified this week that the Treasury, under Brown, forced spending cuts at the Defense Ministry that affected the purchase of future equipment. Such cuts would have affected the ministry's ability to buy helicopters, body armor, and weapons that would have been used in the fighting in Afghanistan. "We then had to look hard at our budget and make some rather difficult cuts in the future equipment program as a result," Hoon testified. Hoon said the Defence Ministry's budgeting structure in 2002, the year before the Iraq invasion, allowed officials to save money by using and maintaining existing equipment. Officials were able to use the money they saved as cash for other spending, Hoon said. A year later, Hoon said, the Treasury lost that ability to spend the money it saved for other purposes. "I think the Treasury realized that we were spending rather more than they thought we should because of this flexibility," Hoon testified. "They told us we had to stop. Now, that caused quite a lot of problems, because we had been spending at this higher rate, and moreover we had quite a lot of plans for this future equipment based on this flexibility." In subsequent spending programs, Hoon said, "we asked for significantly more money than we eventually received." Brown served as chancellor, or head of the Treasury, from 1997 until 2007, when Prime Minister Tony Blair stepped down and Brown took over the top post. Alistair Campbell, Blair's former spokesman, testified this month that Brown was part of Blair's inner circle, discussing questions about the Iraq war. "I would certainly say that Gordon Brown would have been one of the key ministers that he (Blair) would have spoken to regularly," Campbell said. British Parliament member Angus Robertson, of the Scottish National Party, said he believes Brown's appearance at the inquiry before the election is a good idea, even if damaging information emerges. "Given the public interest in this as a policy issue -- I would argue a policy disaster -- one that is also relevant to the ongoing situation in Afghanistan, (it is important) that we hear all the facts both to the benefit of the inquiry but also to help voters make up their mind in the general election," Robertson told CNN. "As the U.K.'s finance minister, he was ... responsible for not providing key resources for troops at the front line, and our troops unfortunately were often without body armor, without the helicopters they needed, and with the incorrect camouflage for desert conditions," Robertson said. "All of this happened on Gordon Brown's watch and that's why he needs to answer questions about all of this." The leader of the third-largest party in Parliament, the Liberal Democrats, had called on Brown to testify before the election. "It is only right that Gordon Brown should explain his role in this disastrous foreign policy failure before asking the British people for their vote," party leader Nick Clegg said in a statement. Blair is scheduled to testify next week.